Start with a film analogy. If virtual reality is “The Matrix”, then augmented reality is “The Terminator”. As the name suggests, the point of VR is to persuade users that they have entered an entirely new reality. The headsets—such as Sony’s Morpheus, or Facebook’s Oculus Rift—block out the surrounding world and, making use of an old trick called stereoscopy, show slightly different images of each to a user’s eyes. That fools his brain into creating an illusion of depth, transforming the pair of images into a single experience of a fully three-dimensional world. Motion trackers, either mounted on the headset or externally, keep track of the users head, updating the view as he moves it around; optional hand controllers allow him to interact with virtual objects. The result is a reasonably convincing illusion of being somewhere else entirely. Augmented reality, by contrast, does not dispense with the real world, but uses computers to improve it in various ways. In “The Terminator”, Arnold Schwarzenegger’s killer robot sees a constant stream of useful information laid over his view of the world, a bit like the heads-up displays used by fighter pilots. So AR and VR are close cousins, and rely on similar technology. But the two technologies have one fundamental difference. VR is immersive: the headsets must, by necessity, block out the external world. Putting one on is tricky enough to ensure that glancing away, as one might do when watching television, is not really possible. The first wave of applications, therefore, are in video games and films, where users (the companies hope) will prove willing to lock themselves into their virtual worlds. AR, by design, maintains its users’ connection with the real world, and that means that a headset is not necessary. Heads-up displays are an early example of AR, but there are others: VeinViewer, for instance, is a medical device that projects images of a patients veins onto his skin, to help doctors aim injections. Many existing smartphone apps also make use of AR. Word Lens, for instance, translates between languages by looking at the world through a smartphone camera, recognising text, and then presenting the user with a real-time image in which that text has been replaced by its equivalent in another language. 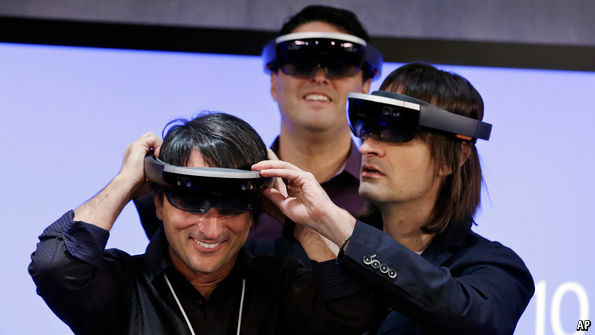 Nonetheless, the biggest AR product to be launched this year is indeed a headset, specifically Microsoft’s HoloLens. It aims to liberate computing from a fixed screen, overlaying its users’ view with useful additions (painting your email across a nearby wall, for instance, or putting weather information on a breakfast table). The firm must hope it does better than another famous AR headset, Google’s Glass, which, after years of development and months of public tinkering, was finally sent back to the drawing board last year.